I'll give Asiaticus the Attack skill. The conversion of Asiaticus to the cult of Mithras is nearly complete. He has heard of a number of initiation ceremonies that must take place, but is not aware of what they might involve. Whenever he asks about the initiation, he just gets greeted with silence and wry smiles from his new found “friends”. Androcles addressed the gladiators one morning. He announced that the next fight will be the last before the great festival of Liber Pater, where the Legatus will be in attendance. 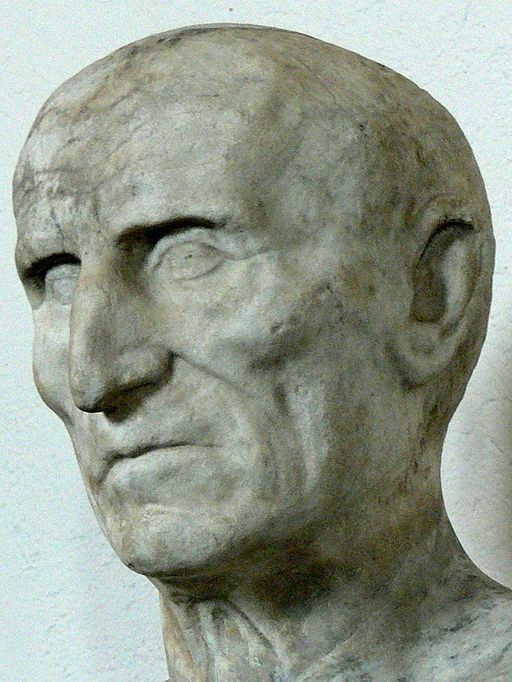 Galba is now the Emperor of Rome, and the Legatus is the most powerful man in Africa. It is not known what happened to the former Emperor Nero, some say he was killed by his own slave, others say that he used his acting skills and disguises to escape Rome and flee to Greece. This upcoming games are dedicated to Mithras! Special Conditions: Senex will be quite distracted in the fight, as he will look in the stands to see if he recognizes anyone from his adventures in the city. Shuffle 10 normal playing cards (numbered 1 to 10, ace being a one). Draw one card after Senex rolls for AP. If the 7 card is drawn, reduce Senex’s AP roll by 2, as he is temporarily distracted when he spots Flaviana in the crowd. If the 10 card is drawn, Senex spots Hannibal in the crowd. Aghast at such a sight, he will skip that turn. As the games are dedicated to Mithras, Asiaticus gains a prayer ability for these games only. If he rolls a natural 6 for AP, he can choose to skip that turn (pauses to pray) and thereafter gains the ability to ignore any negative AP effect from having fatigues, as he is filled with the bull like stamina of Mithras. This lasts until he rolls a natural 1 for AP. Not only does the effect end on rolling the 1, he gains an additional 2 fatigues at that point. Both Asiaticus and Senex are beginning to develop a fan base among the arena crowd regulars, although neither is considered by any means a first-rate fighter yet. They are considered "prospects worth watching" and as "in with a chance" to rival the top fighters over the course of the next few Games. It is also beginning to be noted that fighters from the ludus of Androcles are consistently entering the arena better prepared than their opponents. No one thinks Quadratus is an especially outstanding trainer - what is the secret? I gave Bardelys the same three skills as Asiaticus (Attack, Dodge, Stamina). He is a sica-armed Thracian but wears heavier than usual armour. They came on with Strengths of 11 (Asiaticus) & 9 (Bardelys). 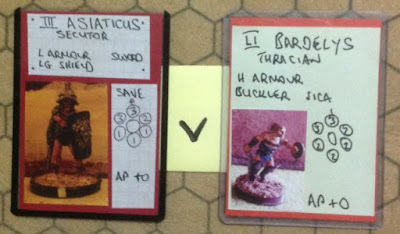 Asiaticus opened the proceedings with an unsuccessful shield-side attack, and Bardelys, scoring max AP, immediately countered with an identical attack, which Asiaticus parried. After a few more inconclusive exchanges, Bardelys' sica got past Asiaticus's shield and caused 4 wounds. Asiaticus replied with a clever sword thrust that took 4 wounds off Bardelys. Both fighters then took a breather. Bardelys stepped away from the fray, and Asiaticus did not follow, preferring to stay where he was and recover a bit (shed his one fatigue). Bardelys then began to try to work around Asiaticus's unshielded flank, but Asiaticus was lucky with AP and surprised Bardelys with an attack on his shieldless side. The potential damage was a staggering 9 wounds but the Thracian dodged and was able to escape the blow. Asiaticus kept up the hassle, and in another similar attack caused Bardelys 4 more wounds. At this point, Asiaticus had 7 Strength remaining, and Bardelys had only 1 Strength, and 1 fatigue. Bardelys launched an all-out assault, but the effort seemed to over-exert him because (double 3 special event) he was knocked down by Asiaticus's defence. However he recovered and stood up to Asiaticus's flurry of attacks, slowly giving ground as Asiaticus took fatigues. He actually managed a dangerous 5-wound attack at one point but Asiaticus successfully parried. Both fighters were using their Dodge skills effectively to escape lethal damage, but the odds lengthened against Bardelys when he tipped into Exhausted status. The end-game was quite long and drawn-out, with Asiaticus following his usual dogged "pursue and bustle" strategy, but never quite getting through Bardelys' guard; and Bardelys grimly resisting and occasionally making a potentially fatal hit which Asiaticus was always able to deflect. But finally Asiaticus made the breakthrough, with a lethal thrust that took Bardelys to -3 Strength, a mortal wound. as Asiaticus was at no point particularly close to being Exhausted. Naturally however he believes all his new-found success is due to the protection of the God. There seems to be something amiss with the big men among Leptis gladiators this season. Remember the disappointment of Titan a few Games ago, who was easily beaten by Senex. Now Senex faces another giant of a man, the Samnite called "Mus" (mouse, it is meant to be ironic) who is fielded with a Strength of only 6, whereas Senex is pumped with a Strength of 10. Strange days indeed, think the more discerning spectators. Despite his heavier status Mus gets all the good AP early in the game, and Senex has to look lively to avoid being caught at a disadvantage. He decides to play a mobile game using his "+1AP" advantage to try and get in some side or rear attacks on Mus. This fails spectacularly as Mus strikes first causing Senex to lose his sword. Deft footwork and good defence enable Senex to avoid worse damage, but how to recover the sword? 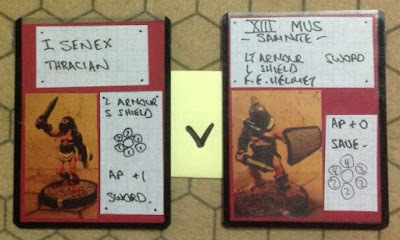 A game of cat-and mouse ensues with Mus chasing Senex but always careful to be between Senex and the lost weapon. At last the right AP combination (low for Mus followed by high for Senex) enables him to make a run for it and get to the sword. But Mus is right behind him and causes 4 wounds in a rear attack before Senex can pick up the sword and get back into action. He grabs it and keeps running to put distance between Mus and himself. Spectators close enough can see him darting anxious glances into the stands as if expecting to see something. But what? Then Senex gives a sort of shudder, as if he sees a terrible sight, and stands for a moment without moving (draws the Hannibal card). Then he seems to recover, smiles and waves (Flaviana card, both cards were together at the bottom of the pack). It is noted that these strange behaviours happened after he had been looking towards the seating bloc reserved for the lowest of the plebs. Luckily while this mysterious behaviour is happening (and being noted by Quadratus and Androcles among others, although they are as mystified as anyone) Mus has slowed down (some average AP at last) so Senex has time to gather his wits and plan a new attack. He has lost 4/10 Strength and is lucky it is not a lot more, whereas Mus is unharmed. Mus may be a rookie but he obviously cannot be taken lightly. Senex announces he is back in the fight with an attack on Mus' unshielded side, but his thrust is parried. Mus counter attacks but also fails, and several rounds of unsuccessful attacks follow. Then Senex makes the breakthrough, with a "double 6 special event result. Mus takes 2D6=5 wounds, and is reduced to 1 Strength & 2 fatigues = exhausted status. He recovers well and even manages to mount some potentially dangerous attacks on Senex, but all are unsuccessful and only increase his exhaustion level. Mus is able to hold off Senex for a few moves, but with exhaustion eventually building up to -3AP each turn it cannot last. Eventually Senex gets through with a lethal 5 wound attack, killing Mus outright. Perhaps Senex will develop a reputation as a "giant killer" - unless of course both fights were arranged beforehand? But either way, it has been a good day for the ludus of Androcles!